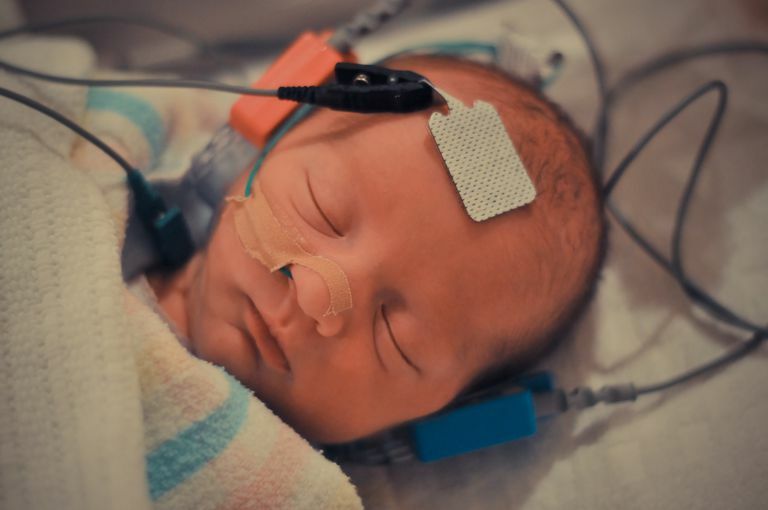 BAER (Brainstem Auditory Evoked Response) testing is usually performed if your infant has failed their otoacoustic emissions (OAE) testing unless your child was born prematurely. This test can also be used if there is any reason that standard hearing tests cannot be performed. Head sensors and earphones to evaluate your infant's auditory nerve, cochlear, and hearing pathways to the brain. Approximately 3 out of 1,000 infants are born with greater than a moderate degree of hearing loss. Hearing loss, if not identified and corrected early, can lead to developmental delays and require a greater degree of speech therapy. It is routinely performed in place of a behavioral hearing test on those who are unable to cooperate with a standard hearing test (for example infants, those with developmental delays, etc. ), but it can still be used to detect hearing loss. Other Names For BAER Testing: Auditory Brainstem Response (ABR), Screening Auditory Brainstem Response (SABR), Automated Auditory Brainstem Response (AABR), Auditory Evoked Potential (AEP), Brainstem Auditory Evoked Potential (BAEP). How Is BAER Testing Performed? BAER testing is not painful and can be performed while your child sleeps or rests with their eyes closed. Movement and tension can cause false abnormalities in the test, so if your child is unable to relax, they will be sedated. After all the equipment is in place a series of clicks, hisses, and other sounds are played. During BAER testing, no response from your child is necessary. The sensors pasted onto their head detect brain activity while noises are being played into your child's ears through the earphones. The test will not check their ability to hear different levels of noises, as only one tone and one volume is used. The head sensors generate a graph with 7 major waveforms as the stimuli (sounds played in the earphone) travels from the ear to the brain. An audiologist reviews the results by evaluating the latency (distance or time between peaks of the waves) and amplitude (height of the waves). While there are 7 waves, only waves I, III, V are significant in determining any abnormalities. The audiologist will then either provide you with either a pass or fail result for the BAER test. BAER is commonly performed on newborn infants to screen their hearing and is often used in conjunction with OAE testing. If there are no complications with your child's delivery, OAE will likely be performed and BAER testing only if OAE is failed. If your child is born premature or has a risk for neurological impairment, BAER testing will be performed first. If your child does not pass BAER testing it does not necessarily mean they are deaf or have permanent hearing loss; further testing is needed. Another common reason BAER testing will be performed is if you have a child with a developmental delay that cannot have other forms of testing done to check their hearing. It is important to realize that even if your child does pass BAER testing, they can still develop hearing problems later in life. American Academy of Pediatrics. (n.d.). Early Hearing Detection & Intervention Program. American Speech-Language-Hearing Association. (n.d.). Auditory Brainstem Response (ABR). Goldenberg, David; Goldstein, Bradley J. Handbook of Otolaryngology Head and Neck Surgery. 2011. p 73-77. Markand, O.N. (1994). Brainstem auditory evoked potential. J Clin Neurophysiol. 11(3):319-42.